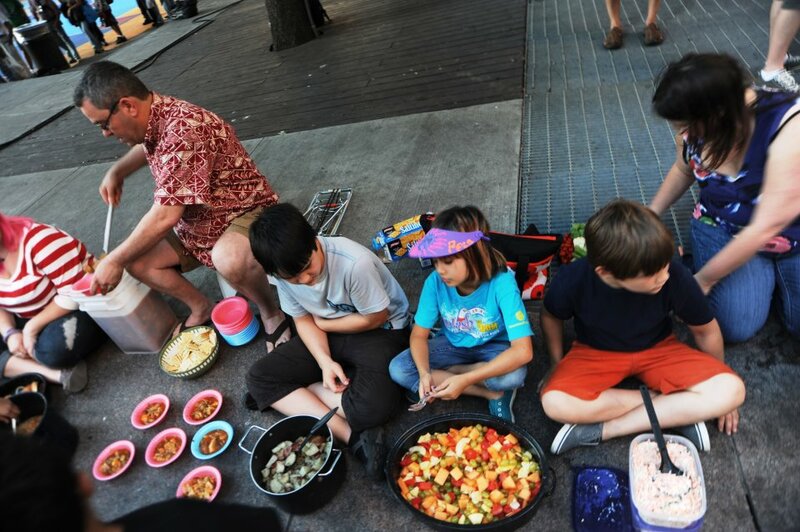 Want to hear from people are involved in Houston Food Not Bombs? “Bring what you can, take what you need” has always been my motto. I feel it is our privilege and also our duty as humans to help those in need. What we do for the least of us helps us all become the best of us as loving human beings. When we treat everyone with dignity and kindness we can all have the opportunity to heal if needed, to share when we can, and to love with our utmost ability. Bringing healthy food to share with those in need is personally rewarding in many ways. Obviously, helping meet a need that exists in our community is satisfying in a general altruistic sense. However, for me the true joy comes from the one on one interactions with the people we help to feed. These are usually brief but very genuine moments of personal human contact. Care and appreciation are often exchanged. I started coming to Food Not Bombs with my best friend Dena on Ash Wednesday of 2010 because I was a) vegetarian and b) believe it’s essential to participate in organizations that enrich one’s community. Throughout our undergraduate years, we went pretty much every Wednesday to share food and hang out with our friends. 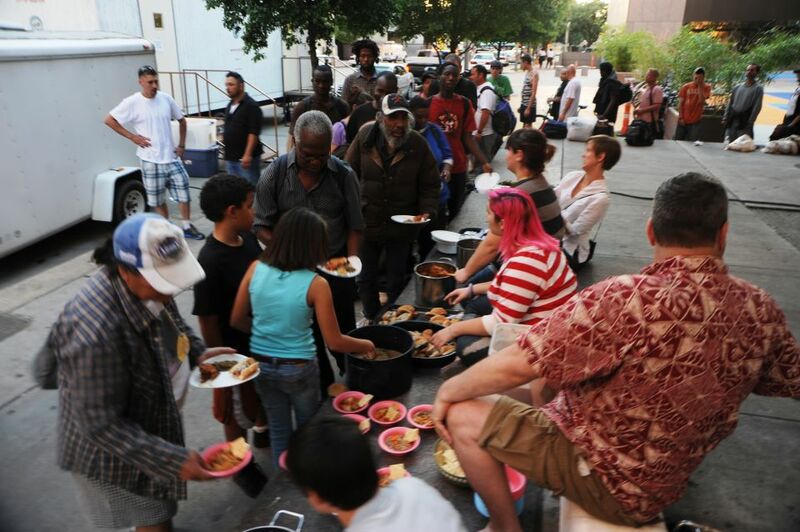 What I love most about FNB is that we don’t rely on government money or church tithes: we use our own resources or use food that would have been thrown away to reach a vital need in the community. There is very little bureaucracy: we make collective decisions and anyone can come serve at any time. 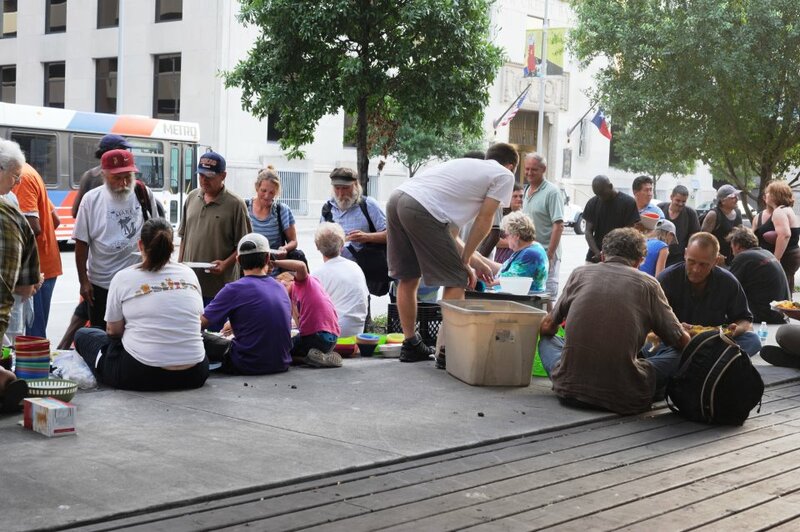 In 2012, the City of Houston amended the city ordinance limiting the freedom of individuals to share food in the community. Every week, our rag-tag FNB group would go speak at City Council, petition neighborhoods and events, spread the word every where we went, and did anything we could to convince the council not to pass the ordinance. These were some of the most frustrating, exhilarating, and heart wrenching months of my life as I spent most of time that semester working on these efforts. I got a ‘D’ in my accounting class I took that semester but I learned far more working in the community than I ever could in that class! I’m not actively involved in FNB right now but I want to start going back more regularly. I have been traveling recently and sharing stories of Houston with the new people I meet; most are surprised to learn about the activism and advocacy that is happening in our city. It’s important for us to continue to work and support these groups and do what we can to make Houston even more awesome! I had been wanting to give back to the community without just giving money. My friend suggested we cook for FNB then serve the food one night. It was a surprisingly eye opening experience. I left feeling fulfilled that we helped people in need. What a great way to spend a Friday night!! !… Or a Monday, Wednesday or Sunday evening if it works better for you. I’ve been dying to get out and volunteer for quite a while, but between my unpredictable work schedule and the necessary correspondence, scheduling, signatures, etc. it has unfortunately never really worked out for me. Food Not Bombs is perfect for me and probably you too!!! It’s easy, casual, fun, interactive and most importantly, the difference that you are making is more than tangible by all o the smiling faces and full bellies!! For me personally, Food Not Bombs has provided me with a Friday night that is very tough to beet: catch up with some good friends while getting creative in the kitchen; make a difference and feed the hungry and share an experience with an undoubtedly eclectic group of people (and myself… Hahaha) (without all of the hassle and barriers); and then extend the moment with a stroll around a place that certainly doesn’t get enough of my time considering how fun an diversity it has to offer… Downtown Houston!!! !